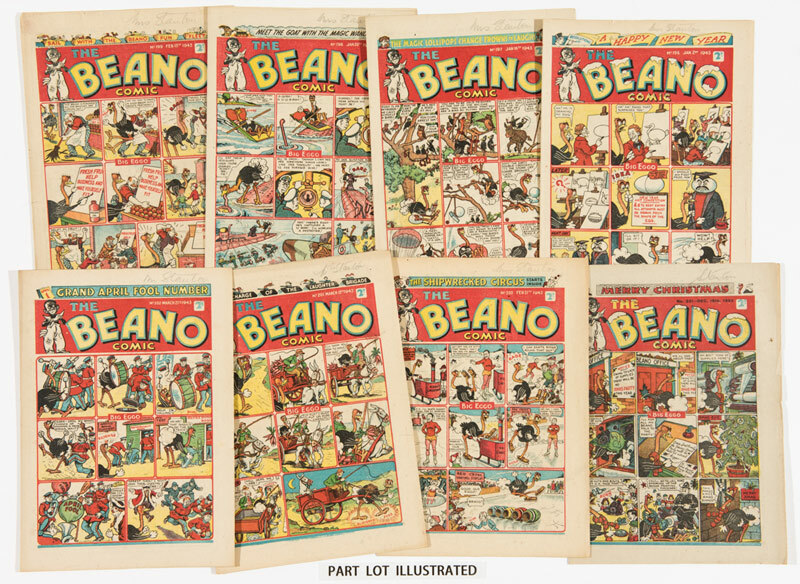 Bought for £3850 in our September 2009 auction our canny buyer re-submitted his purchase six years later having noted the strong performance of early Beano issues over our last few catalogues. 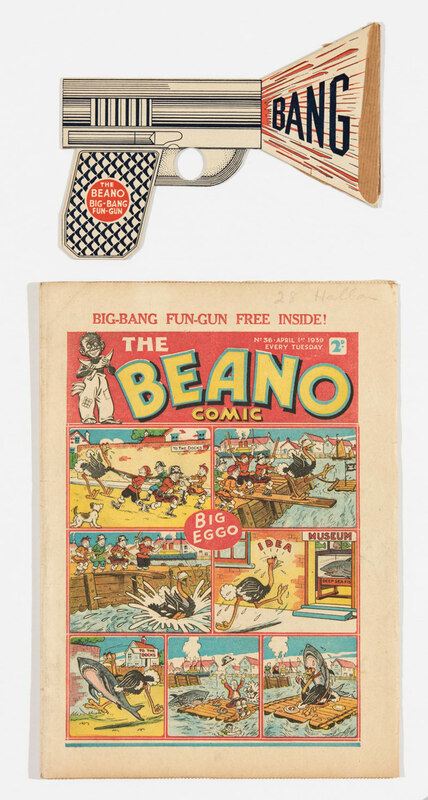 To say he was amazed was an understatement as the new record price for a Beano comic at auction was achieved by two very determined bidders going head to head on the day, the eventual winner bidding from his iPhone in Italy. 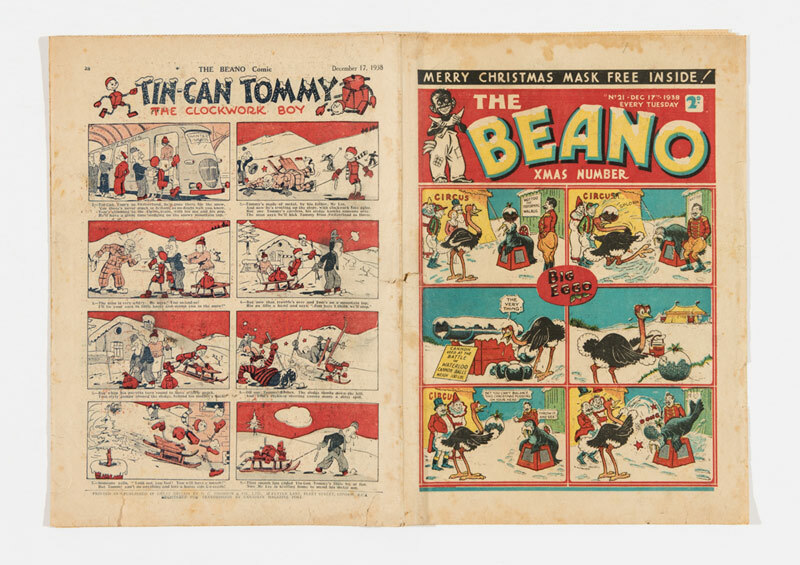 Our run of early Beano issues from Nos 7 – 51 continued to outstrip their estimates generally ranging between £250-600 each with the notable exception of the three illustrated above: No 10 at £660, No 41 the first Xmas issue at £1040 and No 36 with free gift Big-Bang Fun-Gun at £940. Bullseye. 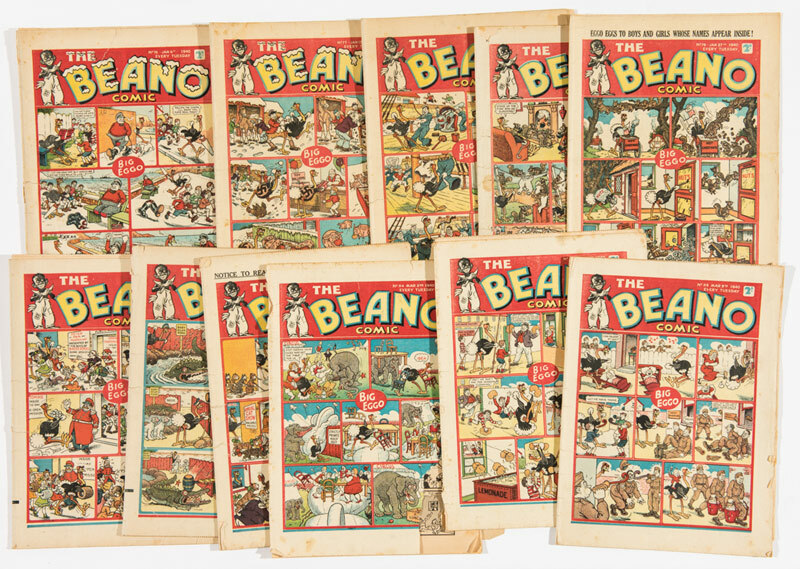 11 consecutive Beano issues, 76-86, from 1940 made £780. 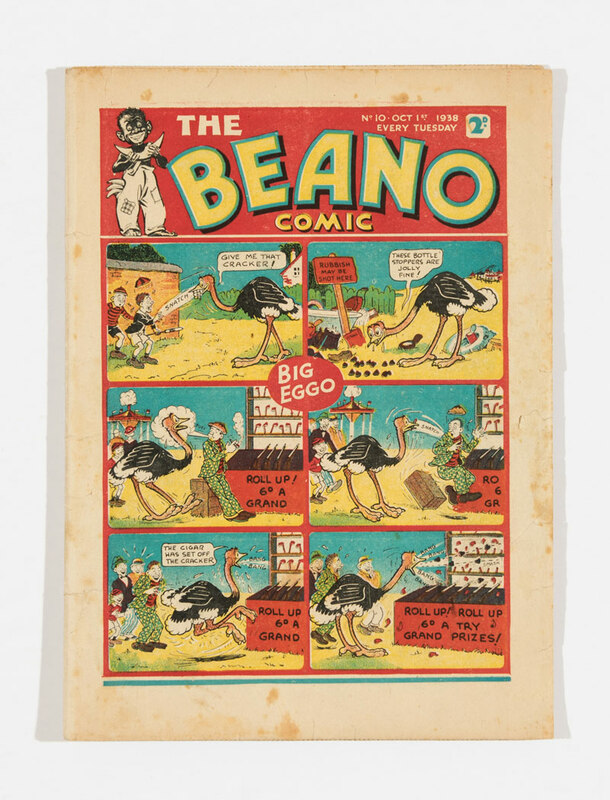 A fresh copy of the 1942 Beano Book took a heady £3050, Big Eggo and the vendor both in a spin. 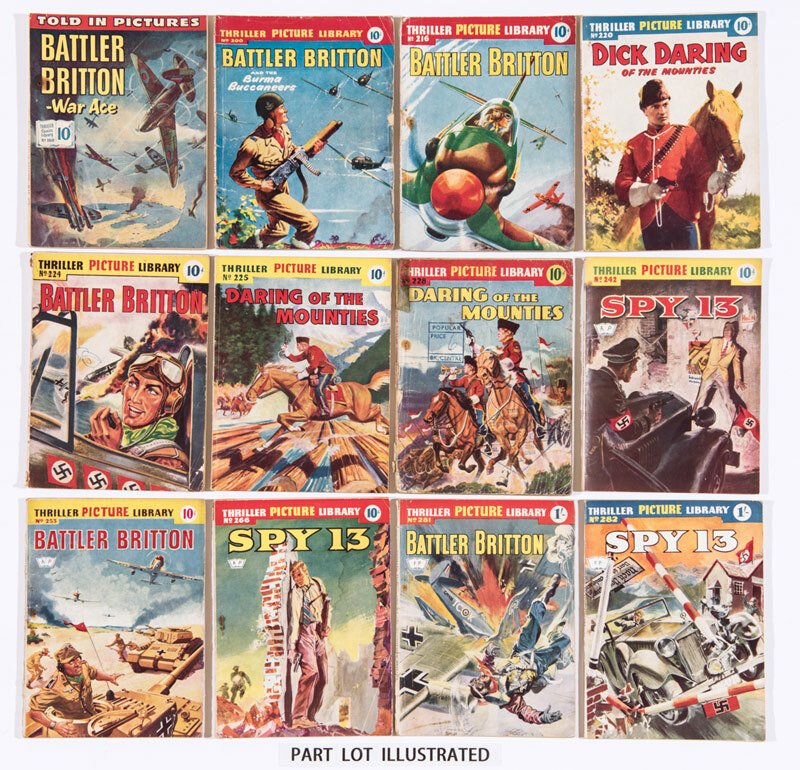 The complete year of 1943 was also keenly contested, its 26 issues knocked down for £2850. 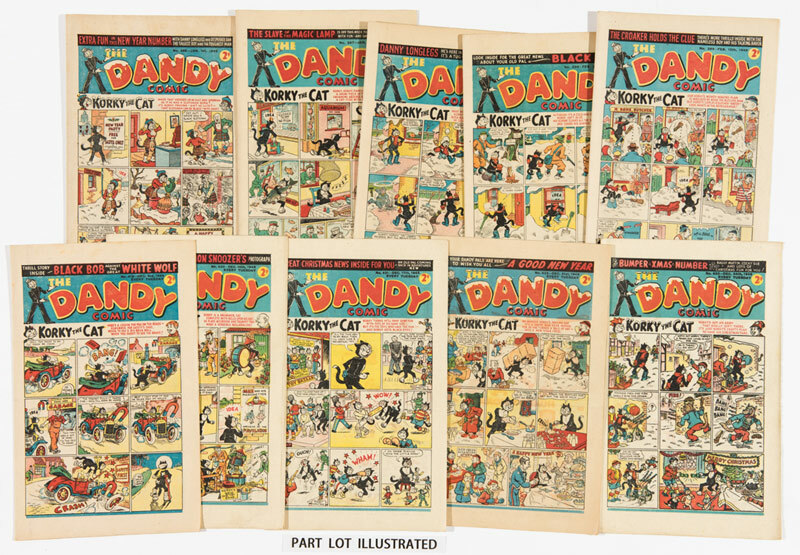 Complete Dandy years of 1948 and 1949 made £920 and £860 respectively. 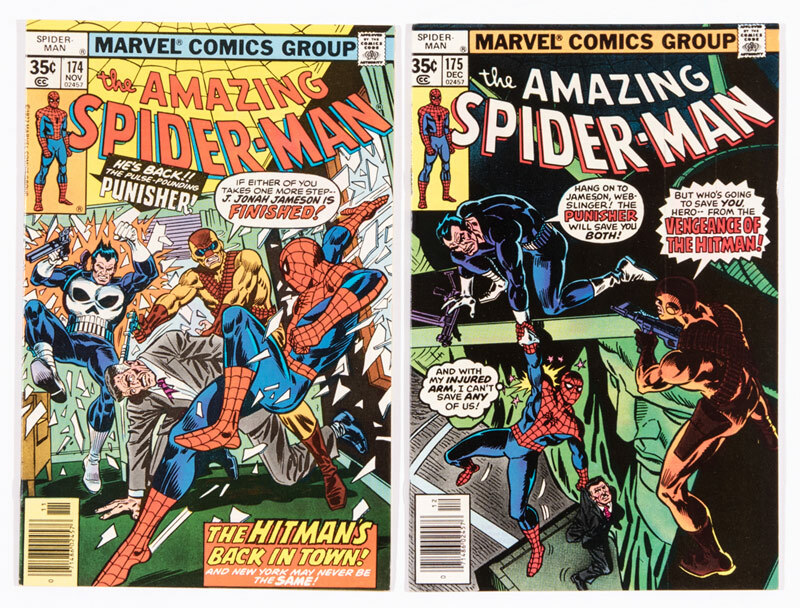 Both purchased by the same bidder who had been after these years in high grade since he started collecting in the ‘80s. 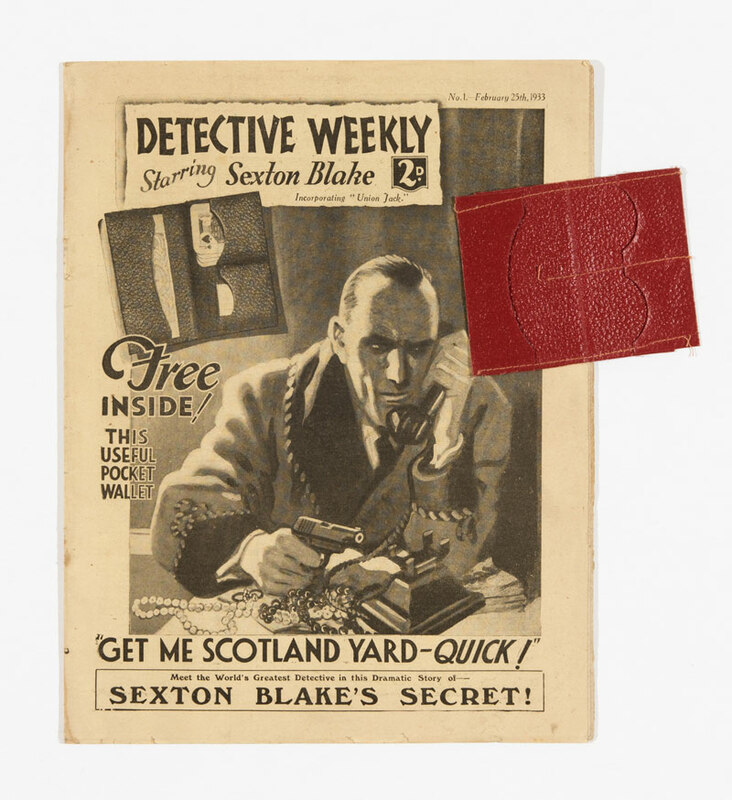 This good-looking copy of Detective Weekly No 1 from 1933 was accompanied by its rare free gift Pocket Wallet and raced to an unprecedented £490. 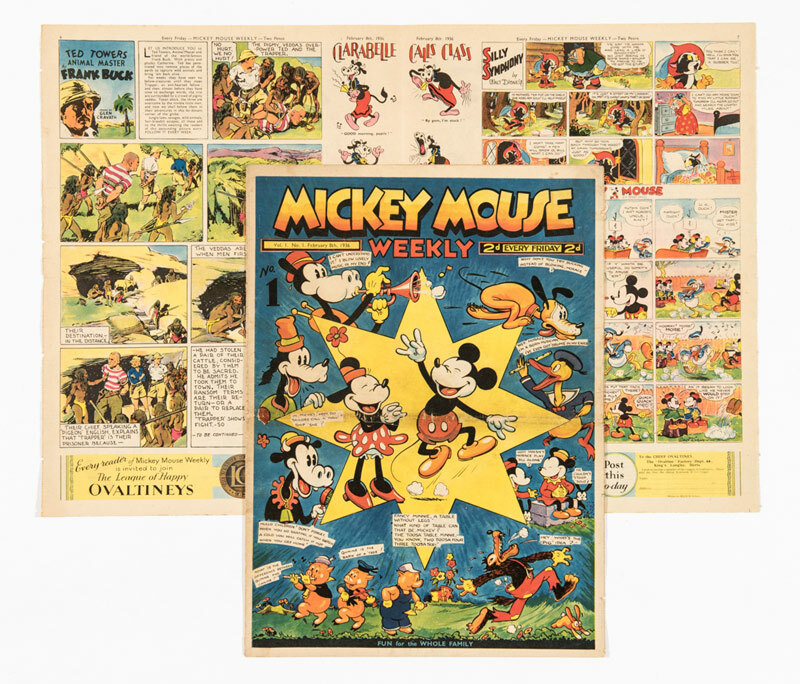 This fresh copy of the first Mickey Mouse Weekly was also the first comic printed by the photogravure process where bleach was added to the paper stock to preserve its whiteness. £170 was duly tendered. 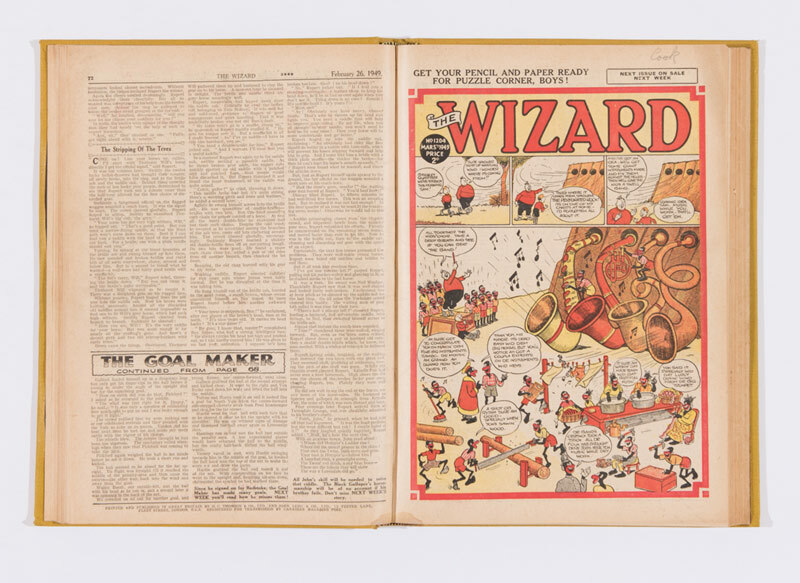 23 issues formulated the complete year of Wizard for 1949 and £160 took them away. 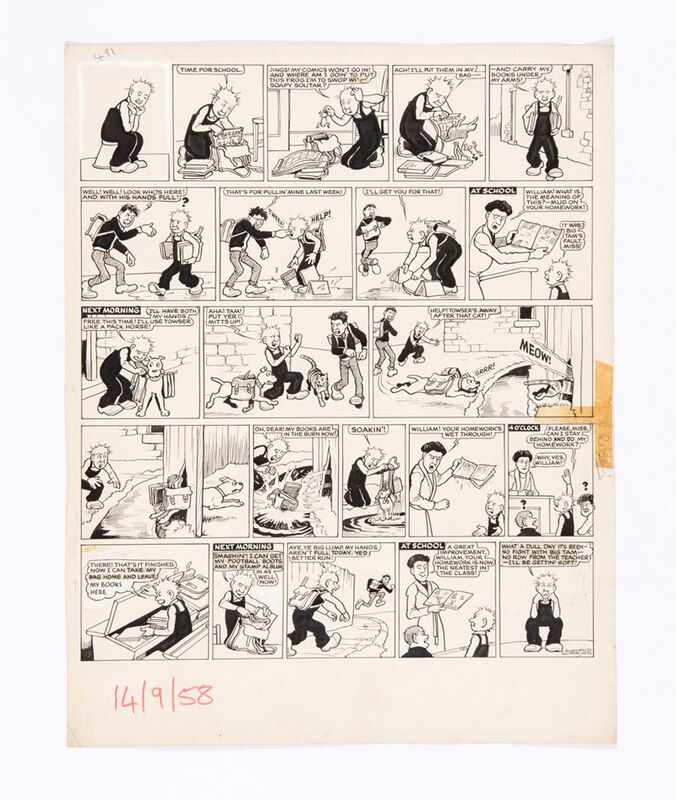 The dog ran off with Oor Wullie’s Beezers and homework and dropped them in the river. The winning bidder ran off with the artwork for £540. 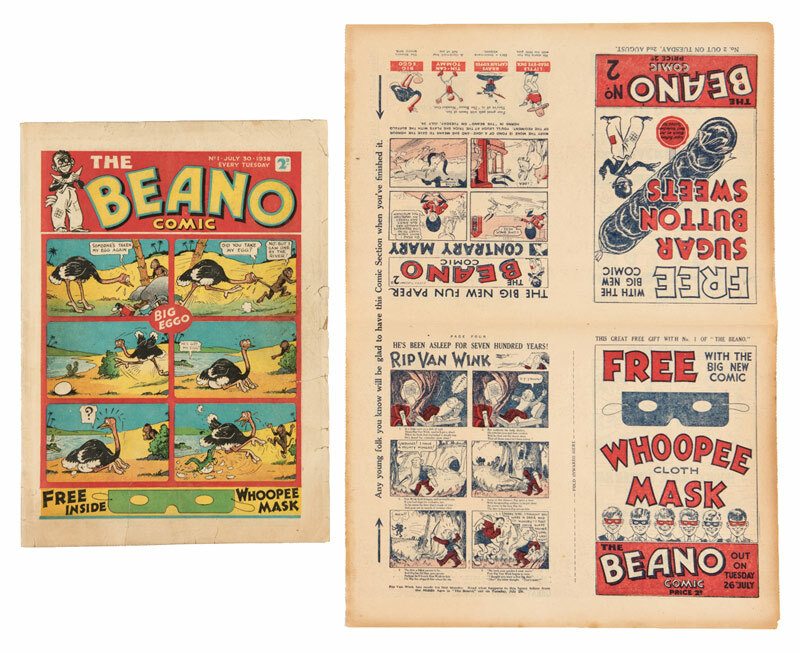 Bemrose Press printed nearly a million copies a week of Eagle in its 1950s heyday but this September saw a record price for the first 52 issues in a bound volume of £2150. 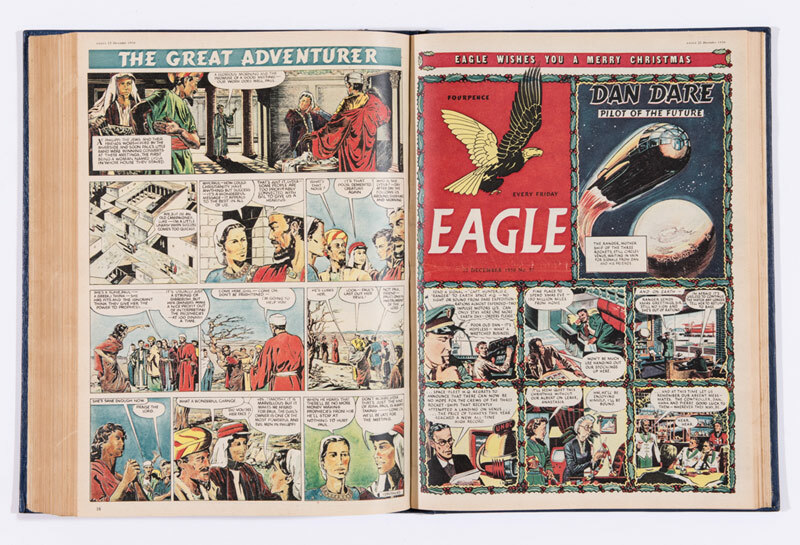 Dan Dare journeyed into the stratosphere. 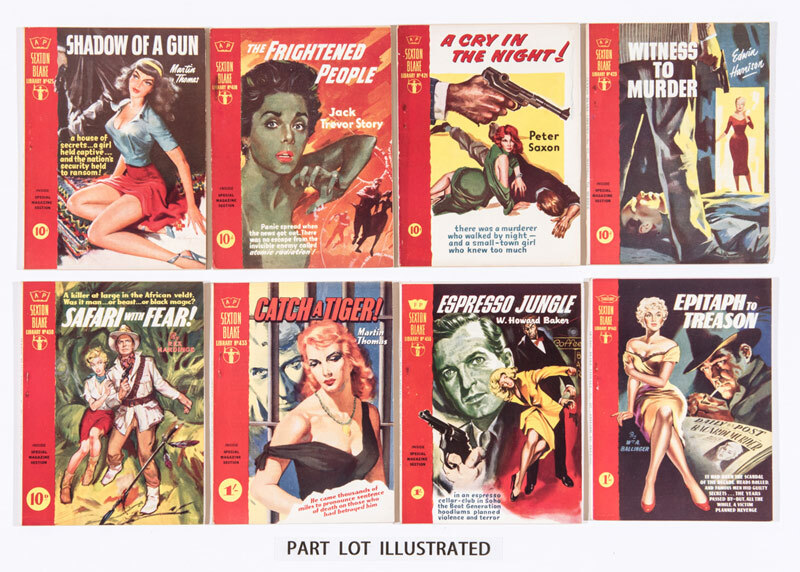 25 Thriller Picture Libraries from 1959-60 in average grades accumulated £175 or £7 each for these ever popular illustrated stories. 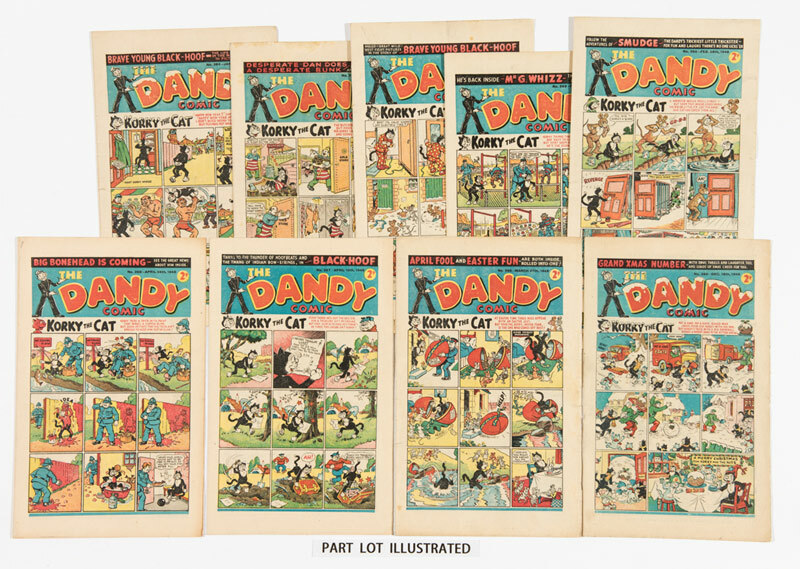 Sexton Bake Library (1958-59) with their hard-boiled detective story covers were well received at £155. 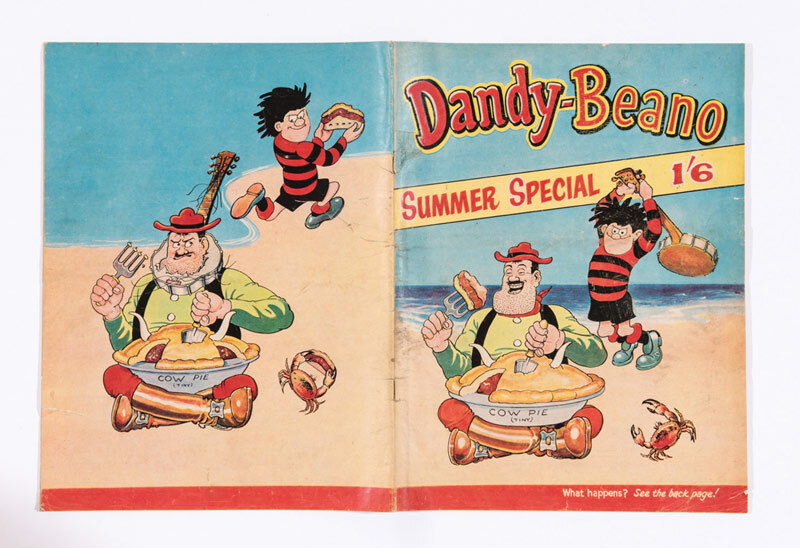 The first Dandy-Beano Summer Special of 1964 is hugely collectable being the first interaction of characters from those two ever popular titles. 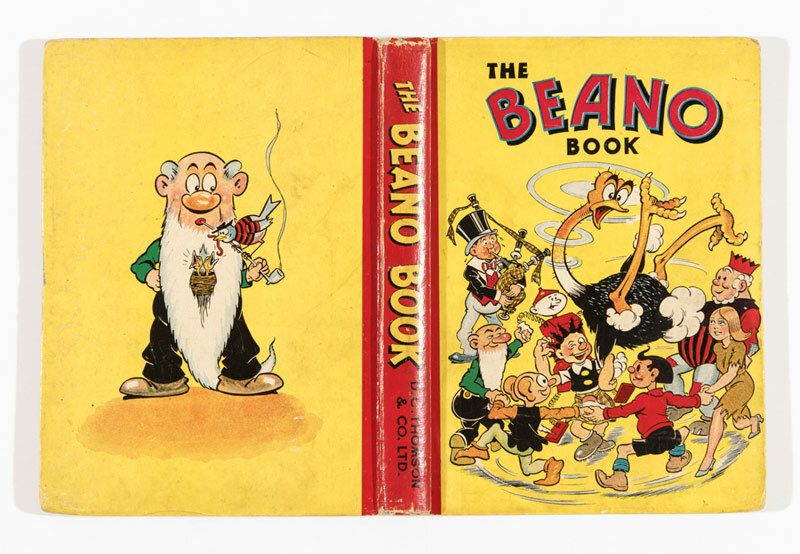 This mid-grade copy fetched a strong £400. 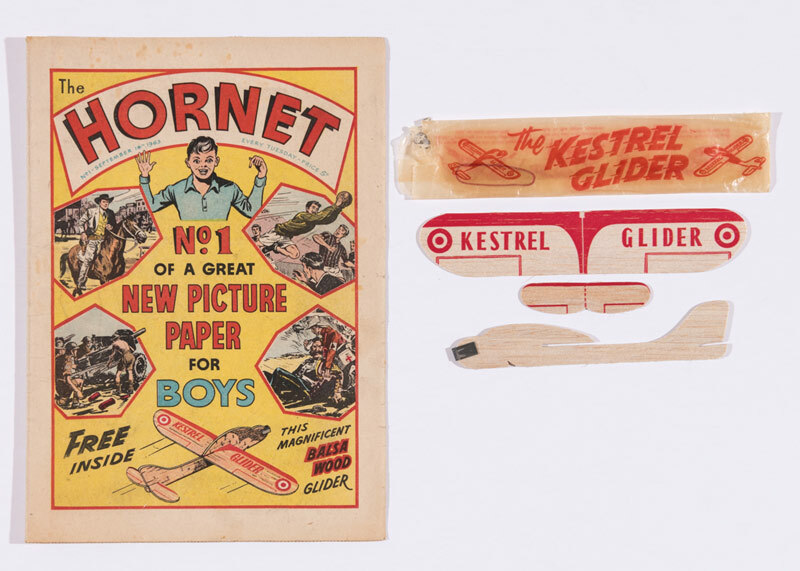 Hornet 1 (1963) with its rare free gift Kestrel Glider soared away to £370. 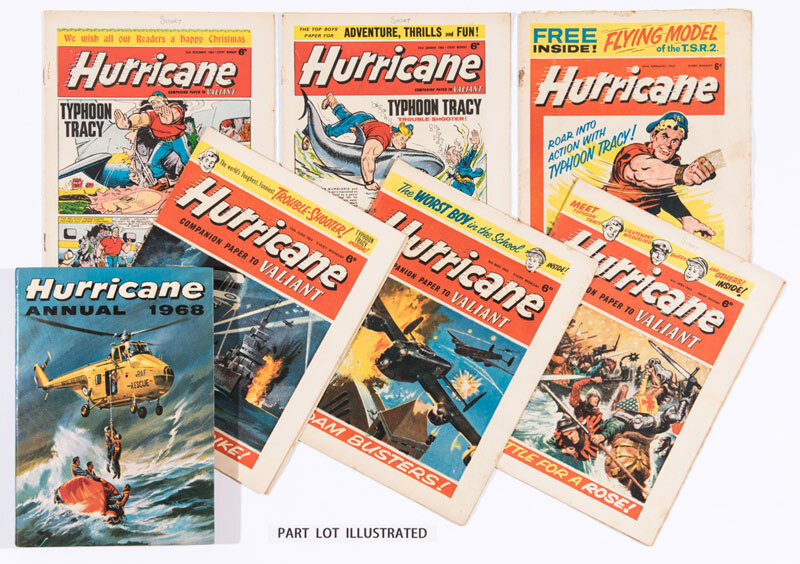 Here was the complete 62 issue run of Hurricane along with the Hurricane Annual for 1968 and £320 blew them away. 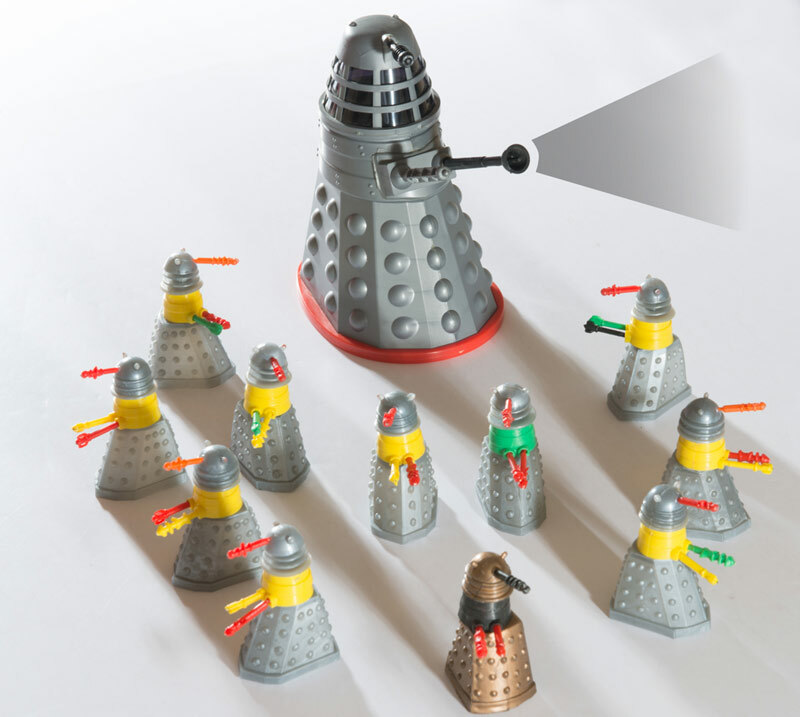 This was our last selection of Dalek Swapits including the rare gold/black colour combination and £180 delighted Davros. 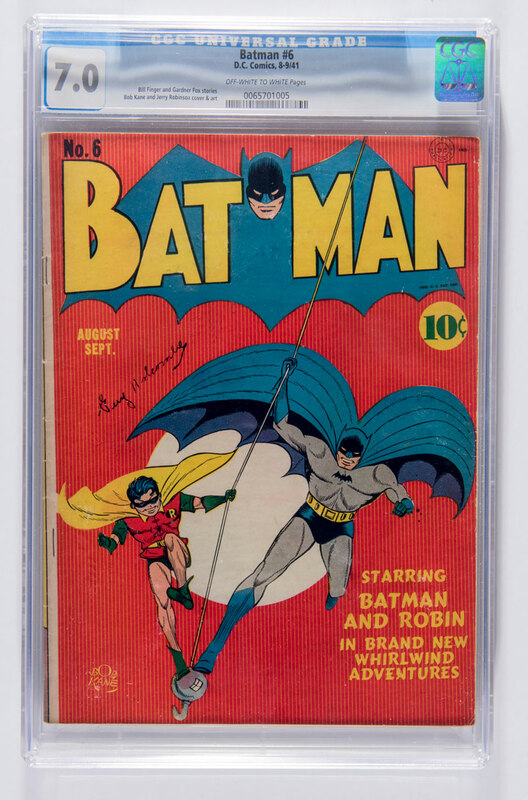 Our US section started with a CGC 7.0 copy of Batman #6 at £1120. 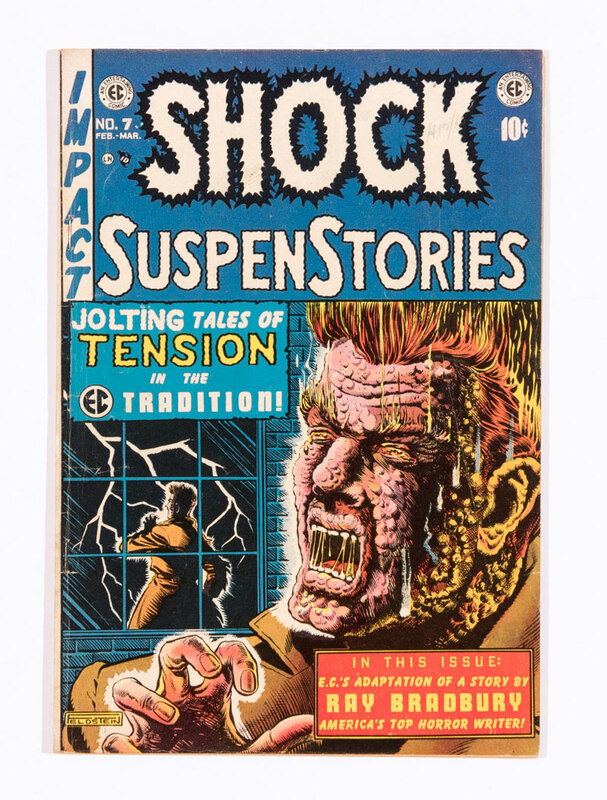 EC issues from 1953 included Haunt Of Fear #17 at £80 and Shock SuspenStories #7 at £60. 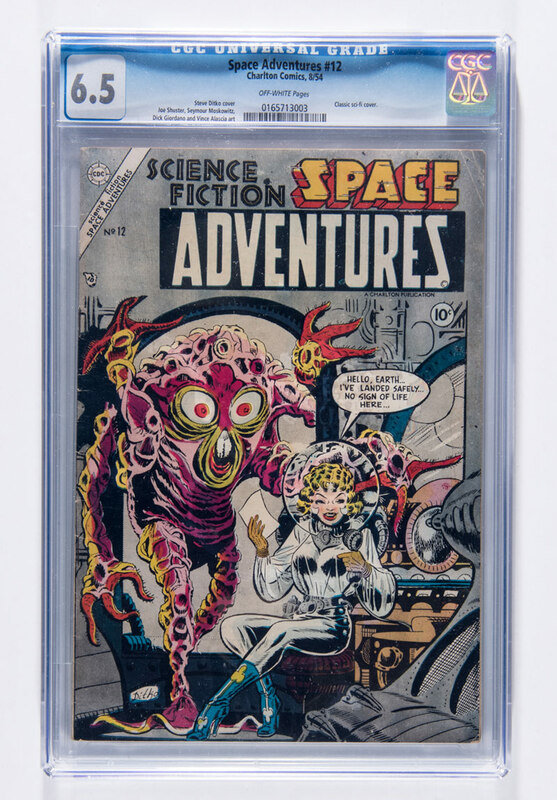 Space Adventures #12 published by Charlton boasted this classic Sci-Fi cover by Steve Ditko and a £140 winning bid. 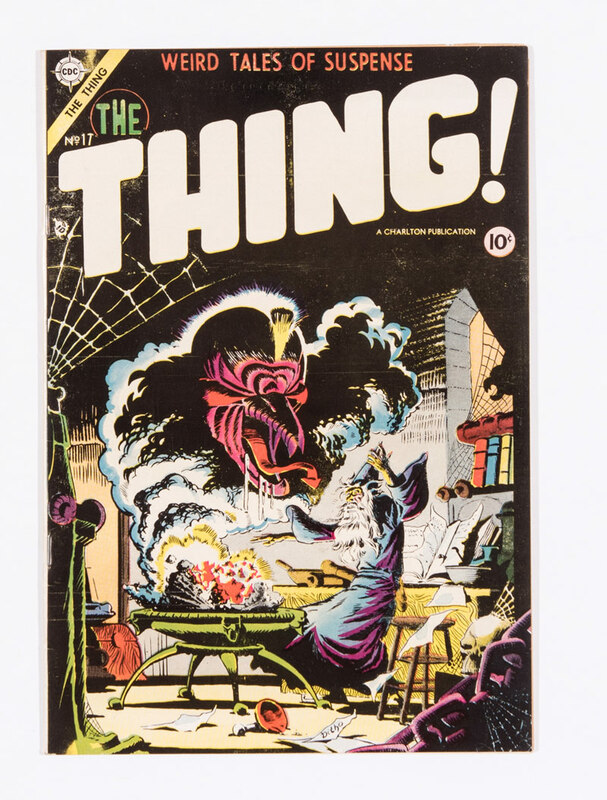 Ditko’s cover for this final issue of The Thing! 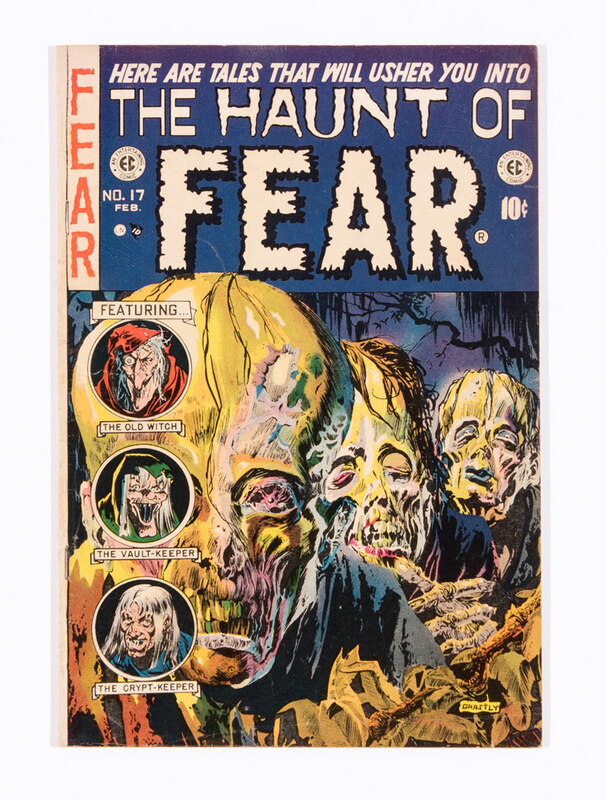 was graded [vfn] and raised a lowish £115, super value for winning bidder. 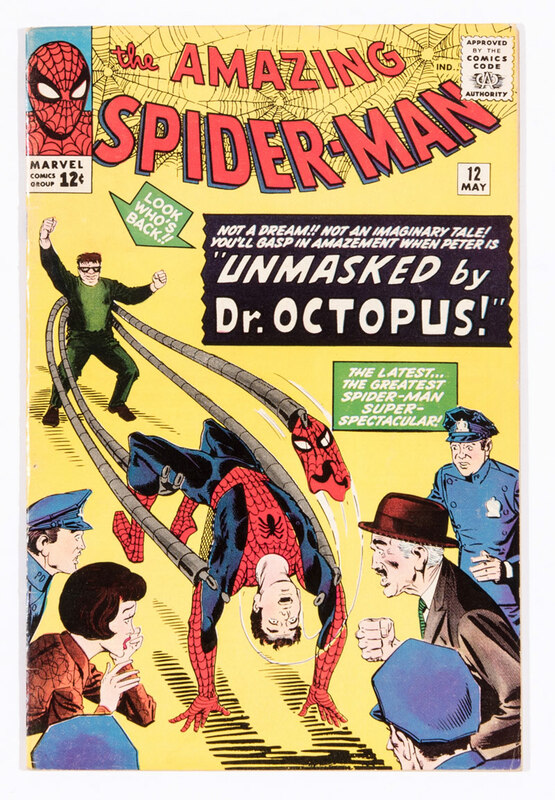 A cents copy of Amazing Spider-Man #12 sold at £145. 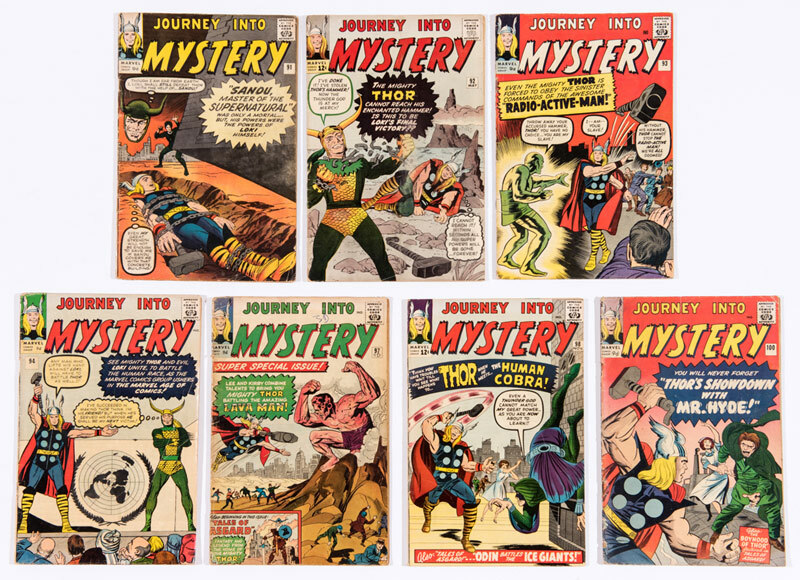 Seven issues of Journey Into Mystery from the mid Sixties in low grades did well at £155. 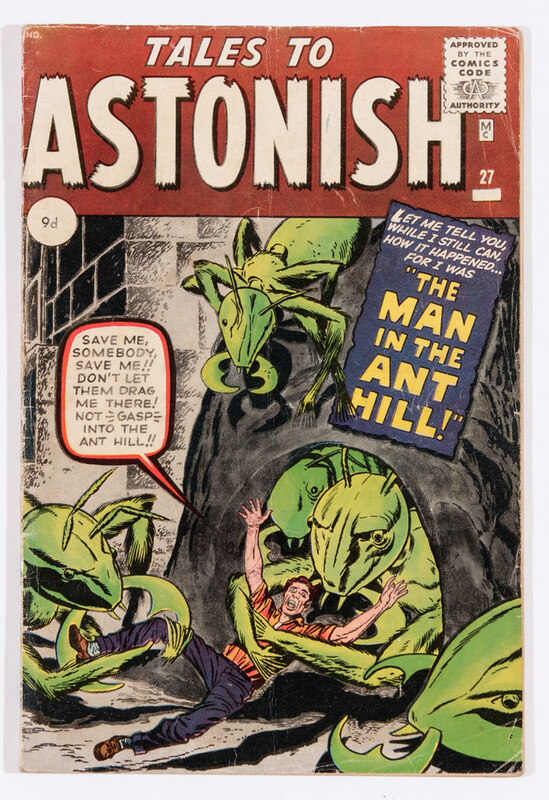 The first appearance of Ant-Man in Tales To Astonish #27 was well bid to £465 as a [vg] pence copy. Light moisture rippling in one corner did not put off determined bidders for this first Punisher appearance at £130. Our 36 piece collection of first print Undergrounds did well to emerge at £185. Who could resist the Leather Nun? Talking of Underground comix, I used to fancy myself as a bit of a hippie. In 1964 I enjoyed my first trip in San Francisco, literally, metaphorically and transcendentally. You must understand, dear reader, that in real life I worked as a counter assistant in the tartan section at John Lewis in London and I had saved up for two years to visit the United States, using the Greyhound Bus to travel coast to coast and anywhere in between for the unbelievable price of $99 over 99 days. Reaching San Francisco was the high point, in every sense of the word, as my old pal, Peter, had moved out West some years earlier and took me under his wing. He was living with his girl-friend near Haight-Ashbury and occasionally employed as a backing singer with Frank Zappa’s Mothers Of Invention and I got to hang out with them whilst I was there. How cool was that for a boy still living at home in Cricklewood whose only relationship with flower power was when he was forced into the garden by his long suffering parents to do well overdue weeding. Fast forward 40 years and last Spring I visited San Francisco once more, comfortably ensconced via Airbnb in an apartment near Fisherman’s Wharf. Keen to revisit Haight-Ashbury, my girl-friend and I embarked on the short journey to my old hippie hangout. Well, there was a fight on the bus, a Vietnam vet refused to move his feet from the seat next to him for a matt-haired old bloke in a filthy overcoat loaded down with shopping bags of the ‘doss down in the park’ variety. As they traded insults then blows, the police were called and we were forced to walk the last few blocks to our destination. Accompanied by some locals we were then warned to put our watches and jewellery in our pockets as we passed a group of gang bangers idling in front of some shuttered shopfronts. All this on a main street at three in the afternoon. Needless to say my long-haired reminiscences were all that remained in an area that supported some tired tourist smoke shops and vintage clothing stores that were more expensive than Ralph Lauren. Back in a trendy café over skinny cappuccinos on foody Hudson Street we watched toned young people in yoga pants descending from and jogging by import Range Rovers. Like I said, I used to fancy myself as a bit of a hippie, man.